Five paintings by the British artist were stolen from the home of a friend of Bacon in July 2015. 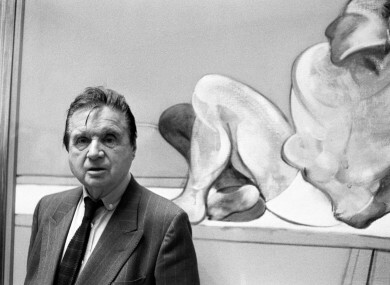 Francis Bacon at the Tate Gallery in 1985. SPANISH POLICE HAVE recovered three of five paintings by British artist Francis Bacon that were stolen from a Madrid apartment in 2015, they said today. “I can confirm that three paintings have been recovered,” a police spokeswoman said. She said she could not give more details because of the ongoing investigation to find the remaining two artworks. The five paintings are estimated to be worth more than €25 million. They were stolen from the home of a friend of Bacon in central Madrid in July 2015 while he was away in London. The thieves also made off with a safe that contained a collection of coins and jewels. Spanish police have so far arrested 10 suspects linked to the theft. In May 2016, with the help of a British firm that searches for stolen art, they arrested one of the suspected perpetrators, as well as five accomplices that allegedly helped hide the paintings. A Barcelona resident had sent the firm pictures of a Bacon painting to see if it appeared on the company’s list of stolen artworks. Police analysed the photos and found clues that led them to another suspect who they believed carried out the robbery. This suspect then led police to an art dealer and his son who are suspected of hiding the stolen paintings. Police did not provide details on the stolen paintings but daily newspaper El Pais said they depicted the owner of the artworks, Bacon’s friend. The thieves tried to sell the paintings on two occasions, the newspaper added. Police recovered one painting several months ago and the other two just a few days ago, according to the newspaper. Bacon often visited Madrid, where he spent time studying old masters paintings in the Prado Museum, and died in the city in 1992, aged 82. Email “Spanish police recover 3 Francis Bacon paintings stolen in 2015”. Feedback on “Spanish police recover 3 Francis Bacon paintings stolen in 2015”.